While government and business may initially come to mind when thinking of Washington, D.C., the nation’s capital also offers couples a wide range of romantic things to see and do. Historic buildings, famous monuments, scenic landscapes and idyllic moonlight views create a beautiful setting to kindle a romance or stoke passion in a long-term relationship. When you are looking for something more than just dinner and a movie, there are plenty of options for wooing that special someone in romantic DC. Consider the following romantic destinations and activities. So you and the girls are setting off for a weekend in our nation’s capital? Grab this handy little guide for the very best of what to do and where to shop, eat, drink and stay. You’re guaranteed to have the perfect girl’s weekend in DC! Washington DC was founded in 1791 to become our nation’s capital. From the very beginning, it was a city that was steeped in history and created out of a need to establish a central location for the running of the government. And while not obvious to anyone walking the streets of this picturesque city today, it was not the first choice for the job. Instead, it was born out of a compromise between those in power during its earliest days. Spring is a favorite time of year for many, and nowhere is this more apparent than in Washington DC. For our nation’s capital, spring signifies the arrival of more than just milder weather. This season marks the blooming of the magnificent cherry blossom trees, creating a vibrant spectacle of gorgeous pink flowers. If you’re planning a visit to DC in the springtime, you’ll be vacationing at just the right time to witness the beauty of the cherry blossoms and participate in the many events surrounding their arrival. While we all know of the popular monuments, museums and memorials that make Washington DC so famous, there are many less famous points of interest worth discovering. When you’re getting ready to visit our nation’s capital, here are a few of the city’s hidden gems you should consider including on your itinerary. Everyone knows that Washington DC is our nation’s capital and that it’s where you can visit some of the world’s most famous monuments and memorials. But there are a few little known facts about DC that many people would be surprised by. Read on to learn more. When heading to the nation’s capital, be ready to explore some of the most popular attractions, monuments, memorials and points of interest ever visited. Washington DC is one of the most interesting places in the world and offers an abundance of things to do and see. Plan ahead by making sure you know how you’re going to get around in the city. 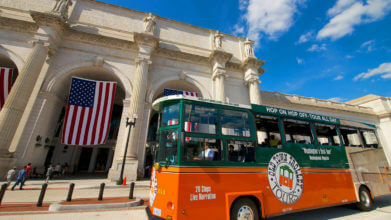 Read on for some of the top modes of transportation in DC. We created this page to help guests plan a great celebration while visiting the Nation’s Capital during Independence Day. We’ll offer you some local tips on the best places to watch the fireworks and celebrate America’s Birthday! A visit to Washington DC is a journey through American history. And visiting the monuments and memorials helps bring the passion of our forefathers, leaders and visionaries to life. Luckily, you can visit any of them anytime and for free. Many of them are located near each other in the National Mall, making your travels easy and convenient. One of the most visited cities in the USA, Washington, DC offers a variety of interesting experiences, from learning about American history and government to seeing many of the most iconic sights in the country. This vibrant city is also home to great food, art, cultural attractions and much more. Read on for the top reasons to visit Washington, DC. If you’re visiting during the Washington DC Labor Day Weekend, don’t forget to include the Old Town Trolley Tours in your itinerary. Our nation’s capital plays host to millions of visitors each year, offering a plethora of historical sites, memorials, museums and interesting attractions. If you’re heading to DC and only have one day to explore, you’ll no doubt want to plan your trip well so you can see as much as possible. At the White House Visitor Center, people from around the world can learn about the amazing history of the White House and the United States Presidency. Discover facts about the architecture and furnishings of the White House, the first families, social events, and relations with the press and world leaders. Visitors can also watch a 30-minute video, entitled “Where History Lives” and see six historical exhibits. A gift shop offers a variety of souvenirs and mementos related to the White House and Washington DC. Park ranger talks, military concerts, and special traveling exhibits are also of interest to guests and available at different times.